Recently, I gave a talk at Oxford which, amongst other things, explained how I choose this or that language to write this or that novel. At first glance it might seem that Uzbek is the language of my childhood, my immediate family, my upbringing, from which I inherited all traditions, and therefore the language that one would expect me to write about my family and childhood in a traditional environment; whereas Russian is the language of my studies, my professional career, my ambitions and consequently the language I would choose to write about my professional life. Yet, if you look at two of my novels chosen at random—for example, The Railway and Gaia, I see that the opposite can also be true. The Railway, which is a book about my childhood in a traditional neighbourhood, is written in Russian; and Gaia, which is written in Uzbek, is a novel about a “first lady”, her studies, career, ambitions, etc. FN: Your latest novel to be published in English, The Devils’ Dance, refers to the imprisonment of one of the leading writers of 1920s, Qodiriy. You have yourself been banned from Uzbekistan, yet one of your books was recently published in Tashkent and was for sale in bookstores. How do Uzbek writers negotiate the political space in their own society and culture? HI: I don’t want to sound dismissive or negative, but it’s not writers, including myself, who negotiate the political space in their societies and cultures. They, as well as I, just write their books. It’s the authorities—be it political, cultural, or literary—that then label those written works as suitable, indifferent, or harmful and malicious. Let’s take the recent example of the Uzbek writer Nurulloh Muhammad Raufxon, who wrote a non-fiction book called These Days, in which he critically discusses the issues of Uzbekistan between 1989 and 2016, during the presidency of the late Islam Karimov. Because he wrote that book during the last years of Karimov’s regime, he had to leave Uzbekistan and publish this book on the internet from abroad. Islam Karimov died in late August 2016 and the writer decided to come back to Uzbekistan. But he was immediately arrested by the new authorities, and although he was released after a wide international campaign, the criminal case against him is still not closed. Therefore, he was ultimately taken hostage by the authorities, who can re-open the case whenever they choose. That apparently is connected to the direction of his writing. As you can see, it’s not writers who negotiate the political space, as they are unfortunately just an object for any arbitrary decision that the authorities make. You asked about my particular case. My book The Devils’ Dance, which is about the iconic Uzbek writer Abdulla Qodiriy and his novel that was left unwritten as he was arrested and shot during Stalinist purges, was finished in 2012 and published online. It’s fair to say that it went viral within Uzbek readership, as readers were reposting it, discussing it in online forums, and republishing it on several Uzbek websites. As a result, it was quite widely read and distributed. When President Karimov died, some people in Uzbekistan dared to publish it without any consent either from my side, or, more importantly, from the governmental side. The text, which was posted in full on the internet, was sent to be published on September 5, when the authorities were preoccupied with the funeral and succession strategies rather than with anything else. Though I always admire “the recklessness of the brave”, as a poet said, I was dreading the fate of those people unknown to me who decided to publish the book. I am still concerned for them. Especially on the backdrop of my deportation from Tashkent airport last year. What consoles me, though, is the fact that the print run was apparently rather small—one thousand copies—and according to what I’ve heard, it sold out quickly, so I hope that the material traces of that brave but reckless act have already disappeared. FN: We have mentioned the figure of Qodiriy, one of the Jadid writers who shaped modern Uzbek literature in terms of language, style and format. Who are the modern and contemporary writers from Uzbekistan, and perhaps Central Asia, in need of attentive reading, translation, and publishing? HI: I can recommend hundreds of writers from Central Asia, but unfortunately their names wouldn’t mean anything to the Western eyes and ears, because none of their work is translated into English or any other “major” languages. Let’s imagine that you asked me to oversee a publishing project: “The best of the Central Asian literature in fifty books”. I’ll tell you what I would include in it. I’d start with stone inscriptions on the “Celestial Turks” (one of my novels, Hostage to Celestial Turks, talks about them), then I’d publish the best of the oral epics—Manas, Alpamysh, and so on (once again, I’ve got a novel, Manaschi, which shows their role in the Central Asian mentality). Then the turn comes to the classic medieval literature by Alisher Navoi, Zahiriddin Babur, Muhammadniyaz Nishoti, and Boborahim Mashrab (many of whom I translated into different languages). You have mentioned Jadid writers, and The Devils’ Dance tells the stories of Abdulla Qodiriy, Cho’lpan and many other world-class writers and poets. Now there is a kind of a fashion to disregard the national literature of the Soviet time, but I could name colossuses like Mukhtar Auezov, Chingiz Aytmatov, Abdulla Qahhar, Berdy Kerbabaev, Oljas Suleymenov, and many others from that time. As for our contemporaries, I love to read the Uzbek books by Erkin A’zam, Murad Muhammad Dost, Xayriddin Sultanov, and the late Togay Murad and Shukur Xolmirzaev. As for other Central Asian literature, I could include works by Rollan Seysenbaev from Kazakhstan, Sultan Raev from Kyrgyzstan, and Tirkish Jumageldyev and Ak Welsapar from Turkmenistan. But not just the prose. For instance, I can mention poets like Muhammad Solih, Usman Azim, and Xurshid Davron. Most recently, I have loved reading Muhammad Sharif, Salomat Vafo, and many others. So I could easily fulfill that imaginary project, provided that there are translators to translate all those masterpieces. FN: Asymptote’s mission is to promote a truly global and diverse literature across languages, and not just into English. From your perspective, what are the initiatives needed to promote Uzbek, but also other underrepresented literatures and languages? HI: I am a bit tired of advocating a place of so-called “small literatures” on the international literary scene. There’s a great “reading the world” trend among readers of translated literature, where they aim to read as many ethnically and geographically diverse writers as possible. Some people, who see the glass half-empty, might say that those “quota” writers are inferior to the modern classics of their own literature, and what’s the point of wasting your time reading substandard literature of an obscure country just for the sake of ticking that country off a list. As for me, I’m sure that in any given literature you could find samples of the highest standard writing like Otar Chiladze from Georgia, Meša Selimović from Bosnia, Chingiz Aytmatov from Kyrgyzstan, Grant Matevosyan from Armenia, Akram Aylisli from Azerbaijan, and Jaan Kroos from Estonia, just to name a few. It would be great to run the same kind of initiatives among translators and publishers too. Another way of spreading different underrepresented literatures is through online initiatives, where the economic dominance of the book industries of developed countries plays a lesser role. I wish that different literatures were mutually translated, bypassing English or other dominant global languages, but it’s rather unrealistic, apart from some regional interconnections (the Indian subcontinent, the Turkic or Persian-speaking world, Slavonic literatures, etc). One can also argue the Afghan case of Khaled Hosseini and Atiq Rahimi, as well as other writers like them, who “took things into their own hands” and started to write about their underrepresented countries in English or French. I am sure that the number of writers like them will be increasing, although one can also predict heated discussions about their input in their vernacular literatures and their “authenticity” in being represented to the outside world. 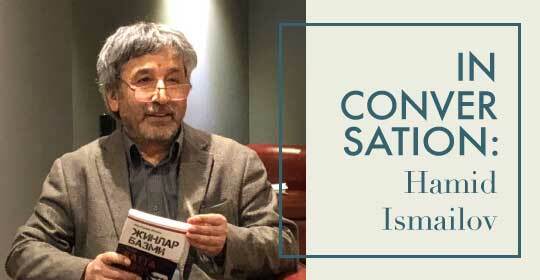 Hamid Ismailov was born into a deeply religious Uzbek family of Mullahs and Khodjas living in Kyrgyzstan, many of whom had lost their lives during the Stalin-era persecution. Nevertheless, he received an exemplary Soviet education, graduating with distinction from both his secondary school and military college, as well as attaining university degrees in a number of disciplines. Though he could have become a high-flying Soviet or post-Soviet apparatchik, fate led him to become a dissident writer and poet residing in the West. He was the BBC World Service’s first Writer in Residence. Critics have compared his books to the best of Russian classics, Sufi parables and works of Western post-modernism. While his writing reflects all of these and many other strands, it is his unique intercultural experience that excites and draws the reader into his world. Filip Noubel is a literary translator and critic based in Prague. He studied Slavonic and East Asian languages in Tokyo, Prague, Paris and Beijing, and has worked as a media trainer in Central Asia and China. He now focuses on contemporary fiction from China, Uzbekistan, Russia, and the Czech Republic, which he translates into French. His translations and reviews have appeared in Jentayu Magazine and in 单读/Dandu Magazine. He is currently translating Radka Denemarková, one of the most awarded contemporary Czech authors, who has also been featured in Asymptote.